Women who have more than four children will be exempt from paying income tax, Prime Minister Viktor Orban has announced. It is part of a bid to boost the country’s birth rate. Orban made the announcement during his state of the nation speech on Sunday, which was accompanied by protests in the capital Budapest. Demonstrators are still angry about the country’s so-called “slave law”, which will allow employers to demand up to 400 hours of overtime per year. Vladyslav Manger, president of the Kherson regional parliament, is accused of organising the murder of Kateryna Handzyuk. Handzyuk, 33, died in November, three months after being attacked with sulfuric acid in Kherson last July. An assailant poured acid on her head. But Kateryna Handziuk is staying strong and has a powerful message for her fellow Ukrainians trying to fight corruption. Update: Unfortunately, Kateryna passed away on November 4 because of the injuries sustained in the attack. We would like to send our deepest condolences to her relatives and friends. The UK’s Brexit minister, Stephen Barclay, will meet with EU negotiator Michel Barnier on Monday to discuss changes to the exit deal. The UK is trying to change the backstop element of the agreement in order to get it approved by parliament before the end of March. The backstop is an insurance policy against the return of a hard border — customs controls and physical infrastructure — between EU country Ireland and Northern Ireland, which is part of the UK. 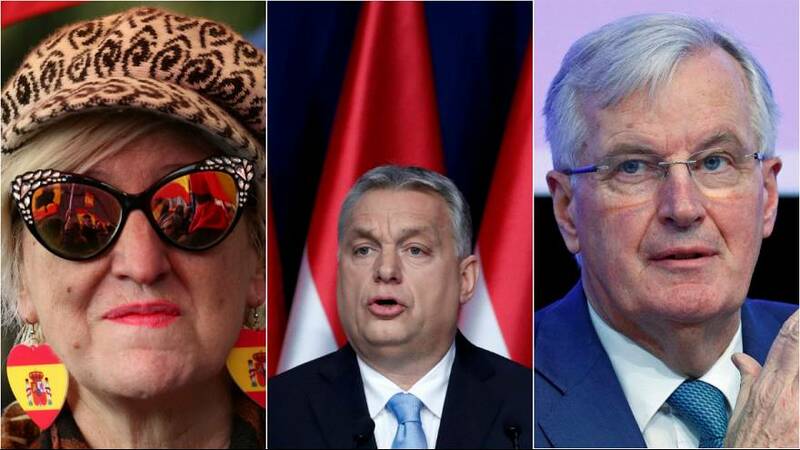 Right-wing MPs believe the backstop — the fallback scenario if London and Brussels cannot agree on a post-Brexit trade deal — could keep the UK in the EU indefinitely. But any border infrastructure would threaten the peace deal between Republicans and Unionists after years of bloody conflict. In Spain, tens of thousands of protesters turned out to oppose the government conceding anything to pro-independence parties in Catalonia. The demonstrators, who gathered in the capital Madrid on Sunday, are against socialist Prime Minister Pedro Sanchez establishing a dialogue with Catalonia's separatist region. It comes ahead of a trial on Tuesday that will see a dozen Catalan independence chiefs in the dock on charges of rebellion and misuse of public funds. Catalans voted for independence in a banned referendum in 2017 and political leaders in the region announced their intention to split from Madrid. The centre-right government then imposed direct rule, dissolved parliament and called snap elections, which nationalists went on to win. Netflix film Roma scooped top prize at the British Academy of Film and Television Arts (BAFTA) awards on Sunday. It won four gongs in total and is favourite to pick up the Best Picture award at the Oscars later this month. Meanwhile The Favourite — which stars Olivia Colman as Britain’s 18th century Queen Anne — won seven BAFTAs.